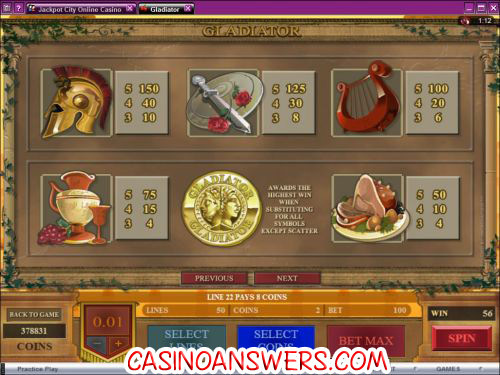 Gladiator Video Slot Guide & Review - Casino Answers! Gladiator is a 5-reel, 50-line video slot from Microgaming. 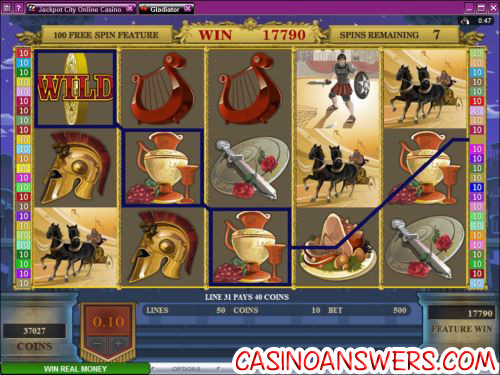 It has wild symbols, scatter symbols mixed pay symbols and a free spins feature. You can play Gladiator at any online casino using the Microgaming platform, such as Gaming Club Casino and First Web Casino.Play at this years #1 online casino for United States - Slots.LV. If you couldn’t tell by the name of the slot machine, Gladiator has a Roman theme. You’re greeted by an intro video when you first click on the Gladiator video slot. Your character (a gladiator) is being reunited with his maiden. The slot has Roman music and Roman themed symbols, including a gladiator helmet, a feast, sword and shield with roses, a harp and more. Coin values in Gladiator are $0.01, $0.02, $0.05, $0.10 and $0.20. You may choose up to 10 coins, so your maximum bet would be $0.20 X 10 coins X 50 lines. For the non-mathematicians out there, that’s $100 per spin. Gladiator is great for high rollers, but if you’re not one of them, you can play all 50 lines of Gladiator for $0.50 per spin if you like. Gladiator has a free spins feature. If you hit three or more scatter symbols anywhere on the reels on a spin, you will win 100 free spins. It’s as sweet as it sounds. All you need is three eagle symbols and the Gladiator video slot will start spinning away. The game takes a while to finish this feature and it gets more enjoyable by the spin as your winnings keep piling up. You cannot win more free spins from your free spins, because we’re sure that if you could, the feature would go on into perpetuity. Gladiator’s wild symbol is the wild coin symbol. It substitutes for all of the symbols except for the scatter symbol. The wild symbol awards the highest win when substituting. The top jackpot in Gladiator is 5000X for 5 Gladiator or Maiden symbols. These two symbols are also apart of the mixed pay feature. Any combination of the Gladiator, Gladiator/Maiden and Maiden symbols on an active payline will award a mixed pay for that line. For those who like a good 50-line video slot, Gladiator is a good choice. It doesn’t have a bonus game, but it more than makes up for that with the 100 free spins feature. If you want to try Gladiator out, a great casino to choose is Gaming Club Casino for the 30 free spins plus 100% to $100 match bonus. Does the Gladiator slot machine have a progressive jackpot? There’s no progressive jackpot to be found on the Gladiator slot, but Mega Moolah has one. What is the difference between the Microgaming and Playtech Gladiator slots? The Playtech and Microgaming slot machines share the Gladiator name, but have nothing purposely in common besides the theme, and the 5000X jackpot (which we are convinced is a mere coincidence). You can play Playtech’s Gladiator video slot at William Hill Casino. Are there any Roman theme slots? Is there a Gladiator Slot Machine?